The top pick of pro snowboarder Gretchen Bleiler, these highly responsive all-mountain and freeride boots ride just as slick and smooth as they look. No boot on the market customizes fit as easily as these do, with 100-percent adjustability you can tweak to your heart’s content, with gloves on, while already locked into your board and bindings. With such a close fit and relatively stiff flex, these are most at home in the steep and deep for hard-charging riding. Out of the box, these are wonderfully comfortable—plush on the inside and plenty warm with Velcro closures at the cuff to keep snow out. They also boast a pleasantly roomy toebox and snug heel. They feature a unique, soft urethane “Boa Conda” harness that sits over the instep of the heat-moldable boot liner. Individually adjustable with an external Boa dial, this harness does a tremendous job locking down the heel for steep turns; no more heels rubbed raw at the end of the day. The downside of the internal harness is that, as someone with high arches, I found it created some mild pressure points on the top of my feet over the course of a full day riding—specifically, at the outside ball of my downhill foot and, when initiating toeside turns, on the tops of my arches. K2’s proprietary “Harshmellow” material—also incorporated in their boards—creates a nice, forgiving platform underfoot. The Contour doesn’t feel quite as pillowy-plush inside as comparable boots on the market, but my feet didn’t feel tired at all after a full day of aggressive riding through bumpy spring conditions. Nothing but praise here for this all-mountain all-star. With a relatively stiff flex and super-dialed fit, these boots ask nothing more of their rider than to think about initiating turns, and turn she shall. The Contour excels at everything—chasing powder, cruising groomers or even playing in the park—though, if you’re looking primarily for a park boot, these tend to be a bit stiff for a full day of getting air. Thanks to superior heel hold, these shine most at maintaining exceptional control on the steepest slopes. While the internal-harness design excels at effortless carving on your board, it tends to be a bit stiff for walking in. Even with the harness Boa fully loosened, I found the ankles to be unforgiving on hikes. The outsoles provided decent traction on most terrain, but could be a touch slippery on sheer ice. I can’t praise this two-tiered Boa lacing system highly enough. Once you experience the ease of it, you’ll never want to go back to any other system! 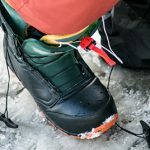 The front Boa adjusts the outer bootlace with a quick crank—easily done with thick gloves or mittens on—while the side Boa adjusts an internal harness that sits over the instep of the boot liner. The upshot of an external Boa to adjust an internal lace is that you can adjust the liner whenever you want, without having to loosen the outer boot—even when your boots are locked into your board and bindings. This means 100-percent adjustability on the lift or even, literally while riding. One particular boon of this is the ability to, with two quick pulls of the Boa coils, loosen the boots entirely on lift rides—then, with two equally quick cranks, lock everything right back in place to ride. With ridiculously easy on and off, this boot is a godsend for any snowboarder who’s ever gotten frustrated trying to snug down laces in cold weather without taking off her gloves.